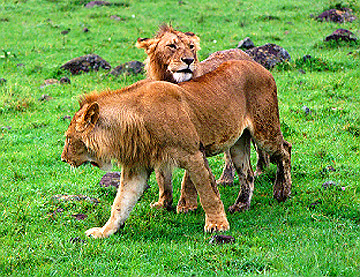 The Masai Mara is Kenya's premier game reserve. 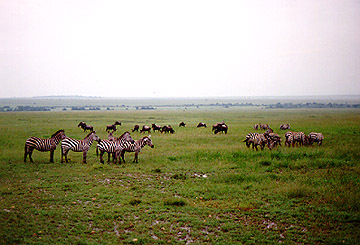 It has some of the highest concentrations of animals in Africa and is famous for the migration of the wildebeast and zebra around August. 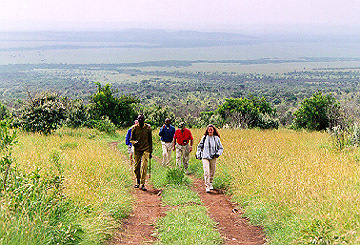 The reserve is owned by the Masai People who will lease land to game lodges. The best animal viewing is during the dry season when animals are concentrated around the waterholes. Mid Febuary is supposed to be the dry season but El Nino gave the area record rainfall for that time. Despite the rains, there were plenty of animals. Dust was absent and green grass was common. 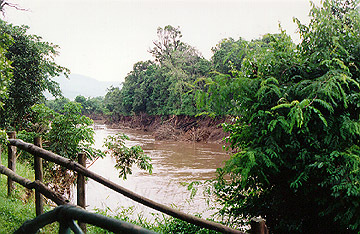 The roads; however, were sometimes difficult to pass and 4wd vehicles were required. 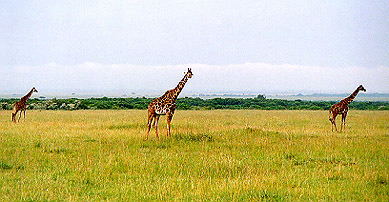 We stayed at the Mara Safari Club for three nights. The permanent tents were like those at Sweetwaters but with canopy beds. The wake-up call was a staff member with hot chocolate or tea and cookies. 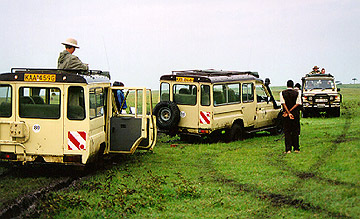 Each day, there was an early morning and a late afternoon game drive. There were additional activities including hikes and visits to local villages. Two members of the group did a balloon ride across the Mara. There was ample time to relax during the day and watch the hippos in the river by the lodge. The grounds had beautiful flowers and trees. Meals were delicious. After dinner, there was usually a lecture by the bar or some of the local Masai would talk about their life and demonstrate some dances. The photos below are only a few of the many species I saw during this portion of the trip. 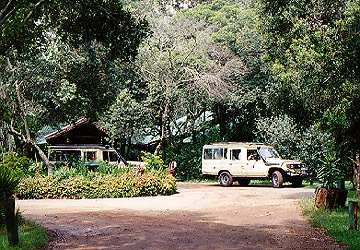 The entrance to the Mara Safari Club. Like other game lodges, you are not allowed to walk outside of the compound though I doubt the lions and leopards would be much of a danger. The view from the deck on my tent. The main group of hippos lived right below in the Mara River and their morning grunting and spashing made a nice wake-up. 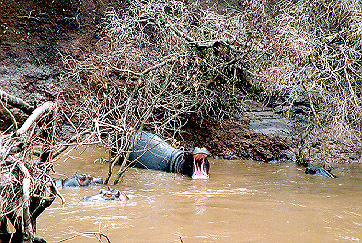 The hippos rarely climbed out of the water during the day. They also yawned though catching it on film was difficult. Hippos kill more people than any other African animal besides man. Never get between a hippo and the water. They look cute and friendly but watch out. 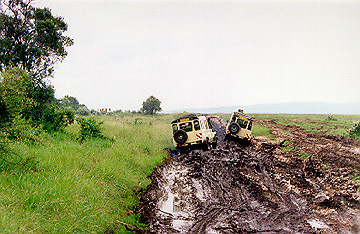 The recent rains made driving a bit difficult even for 4wd vehicles. Hiking up some low hills in search of rhino. Walking was fun but required a guide to watch for animals. We finally found this female white rhino (classification based on snout, not color) and her baby. She briefly charged and snorted to register her displeasure. 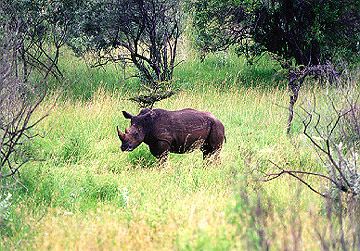 Like Morani, the group of rhino in this hollow are protected by 24 hour armed guard. Unlike Morani, you can't pet this very wild rhino. 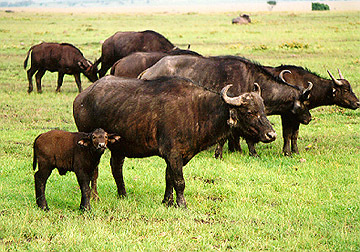 The African cape buffalo is part of the Big 5 from the days of the hunt. The others being elephant, leopard, rhino and lion. They are very dangerous and will charge if provoked. 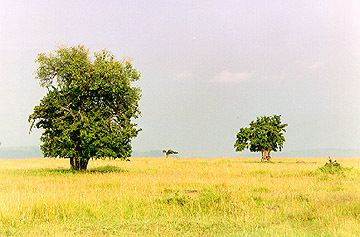 The Mara is famous for large herds of many types of animals. The cheetah is more difficult to find. 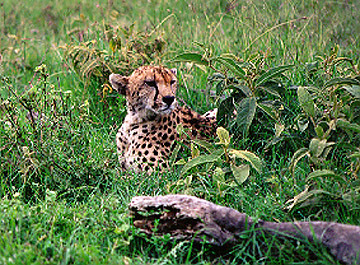 Because of groups of tourists following hunting cheetah, they have changed their hunting times. They are fast but can't sustain their great speed for long distances. We tried to pull another vehicle from the mud and got stuck, requiring a third vehicle to pull us out. While waiting, we kept an eye out for animals especially the herd of nearby buffalo. 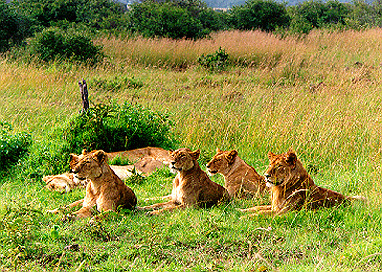 The lions in this pride were all asleep despite our noisy group of vehicles. When there was a distant "scream" from a zebra under attack, the lions immediately woke up. I guess they decided not to help and they flopped back down and went to sleep. 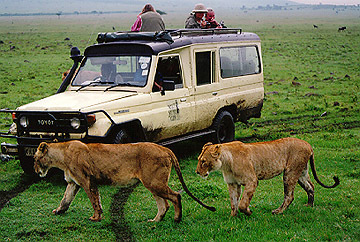 These lion walked right passed our vehicles. By now, they know that vehicles are not are threat nor are they edible.